This is a great look if you want to feel chic in the cold. The boots make it modern. I like the jacket too. Now THAT’S how to showcase and accessorize a beautiful leather jacket. Less is definitely more here. No bag,no phone,no cigarette…looks like a vintage Kenzo jacket. That coat is just amazing! I love the vintage shade concept of styled this pieces! this is best choice for winter seasons. 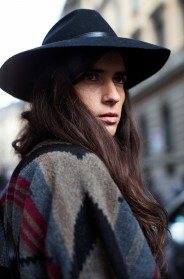 such a great street style around the milan. Simplicity and a quality fit always makes dressing correctly rather easy. Nicely done, and a good example for those of us who often have to pull something together quickly. Keep good basics clean and at the ready. I’m running a bit low on blue shirts, btw. Thanks. Beautiful shearling moto jacket! Love it paired with those black OTK boots & scarf. Camel and black.Totally works for me. Looks like she pinched her boyfriends gloves too. I’m guessing he won’t mind. That is a stunning jacket – love it!! Nice look, but you really need thin long legs to look good in it ! I love the jacket / scarf combo! Girl, you got legs right up to your neck! So casual. Taking a walk somewhere. Maybe to her Mother’s house for lunch. I have a very similar jacket, but with buttons, which are a bit of a bother to close if you have gloves. Seeing this, I wish I had purchased it with a zipper. In any case, she looks great! Great oversized jacket and the boots are a great pairing. Its a simple yet chic look for a cold winter day out. This is beautiful leather jacket. Many thanks for the great posting. I’m glad I have taken the time to see this keep up the excellent work. nice contribution. go on . this is the best and amazing post, I liked it a lot! Thank so much! !